I was just saying on Instagram and Facebook how my chickens took forever to start laying again, but when they did... I mean, look at that yolk! Amazing, huh? 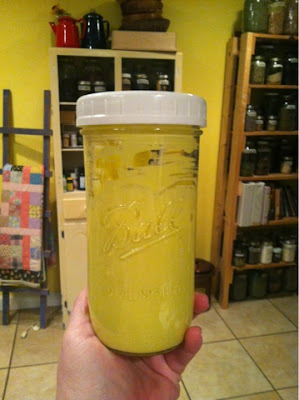 I had just read about making Kombucha Mayonnaise. 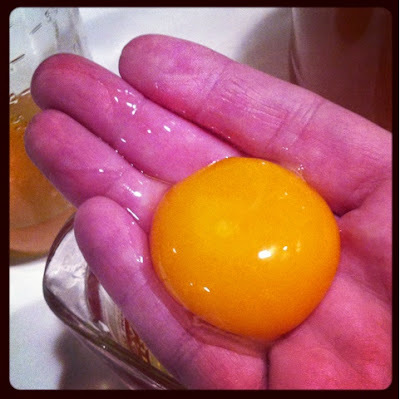 It just so happened that I poured off some kombucha today and I had some great eggs! It's easy peasy and it adds another level of probiotics in your diet. Mix kombucha, egg yolks, mustard powder, garlic powder, onion powder, and salt with a stick blender or in a food processor. Slowly pour in olive oil while blending. Continue processing until you have a thick, creamy consistency. Awesome! This is a really different and out there use for kombucha vinegar. Going to share to our facebook! Thanks for the share! I enjoy learning new ways to culture and thus improve the health of our foods! Enjoy!